You don’t need to live on a farm to start your own garden. You don’t need soil to grow herbs and vegetables either. In fact, all of this can be accomplished with the right lighting and a little bit of water. City dwellers and apartment tenants rejoice! Hydroponic gardening is the way to grow your own produce with little space. And best of all, it’s not difficult to get going. Here are some tips to start a hydroponic garden. Choosing seeds- What do you want to grow? An ebb and flow hydroponics system serves as the foundation of your water-based garden. Choose a leak proof pan and size it according to how many plants you want to grow (6-8 inches deep is a good rule of thumb). Anything can be used as long as it does not leak. We recommend a cat litter pan. You’ll want to line the pan with small pots or K-cups. Anything works, as long as you can puncture a few holes in the bottom for drainage purposes. This is where you will plant your seeds. Fill the pots with a growing medium such as gravel, cotton, clay pellets or sand. This supports the root system. Finally, flood the pan with water making sure it gets into each pot. Let it soak for at least 5 minutes before draining excess water into a bucket. Place a seed in each pot and allow it to soak for about 15 minutes tops. 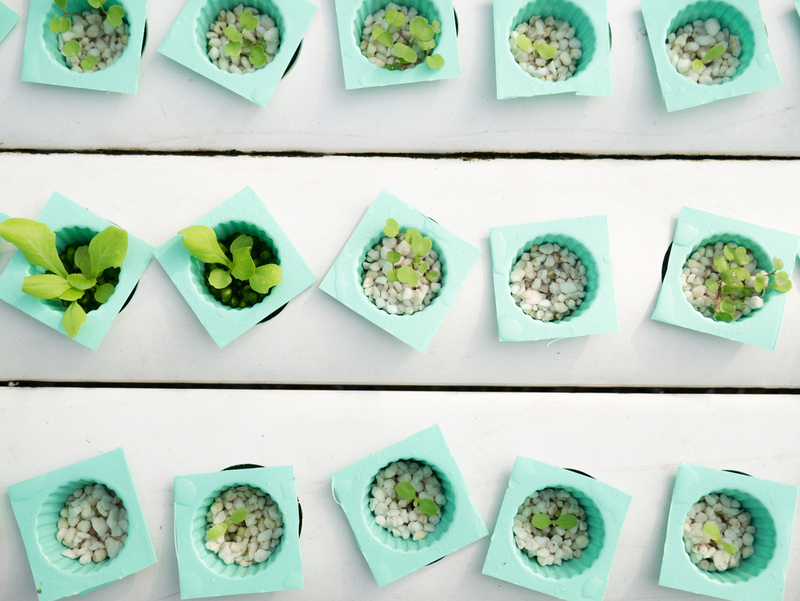 Once the seed sprouts, you’ll need to supply proper nutrients that can be obtained with a hydroponic solution. Liquid solutions are best for beginners, because you don’t need to mess with mixing ingredients like with a powder solution. You must purchase a grow light, which mimics the daylight. Research how much light you need for each type of plant.